Domaine de La Pinte was first planted in the 19th century. However, after the ravages of phylloxera, the vineyards were not replanted until the early 1950s by Roger Martin, a native of Arbois. 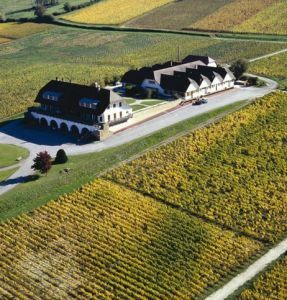 Roger, a wine enthusiast and geologist, selected Domaine de La Pinte because it is situated on a band of blue marl which runs through Arbois to Château Chalon at an altitude of 400 metres. Twenty hectares were first planted, more than half with Savagnin, and the first harvest was in 1959. Today, Roger's son Pierre runs the property. The domaine now has a total of 34 hectares of vines in Arbois and Pupilin including 17 hectares of Savagnin and seven of Poulsard. The vineyards have been farmed organically since 1999 and converted to biodynamics in 2009 and are certified respectively by Biodyvin and Demeter..